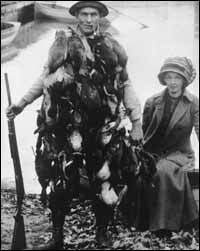 "The Work of a Duck Hunter's Wife"
My memories of [duck hunting in the fall] are of the first time you see him [husband Harold Herrick] start to go and look at his guns. He's been cleaning them interminably anyway, but to take them out of the gun cabinet and start going over them and looking at them and making sure the decoys are untangled, which he thought he had done in the winter before. But, you know as the fall approaches, and endless conversations on the telephone with others who have the same likes, and getting the clothes organized and trying to find last year's duck hunting license, because you have to turn that in order to get a new one, and never can find it, and 'Mary, have you seen it? I know it was in my top bureau drawer,' and panic over that and finally finding it in the place that he knew he'd left it all along. I mean it's just all part of the same picture that my memory goes back to, and but the happiest memories I think are the duck hunting dinners here and at home, but mostly here at the river when we'd have Nelson Bryant from the 'New York Times' who was a dear friend of Harold's and mine, arriving for four days of hunting and - and then writing about them in the 'New York Times'. Beautiful articles, and cooking his magic gravy on my stove and , and making sure that the birds weren't over-cooked and, and the wild rice and the apple and celery salad and the currant jelly all had to be in evidence. You never had anything like cole slaw, or cabbage salad. You had to have the right ingredients for it and it was a big table, and all the duck hunters would be around it and mostly I was the only woman there. That's all they talked about was the birds they had shot, the birds they missed, and if they didn't shoot any, it was the same exuberance, the same fun and the same jokes, and the same everything. It's a great camaraderie, duck hunters have, but I am aware of the dirty clothes and the wet clothes and the, and all that end of it. Basically, Harold bought the dryer so that wet socks could be dried when they'd come in for lunch. They'd arrive at the dock and they'd come in and want to make sandwiches and of course you'd have to have tons of cuts of cold meats and whatnot for lunch and lots of soup and everything and they're sitting around making another whole mess in your kitchen. But it was very important to me and lucky I had it.